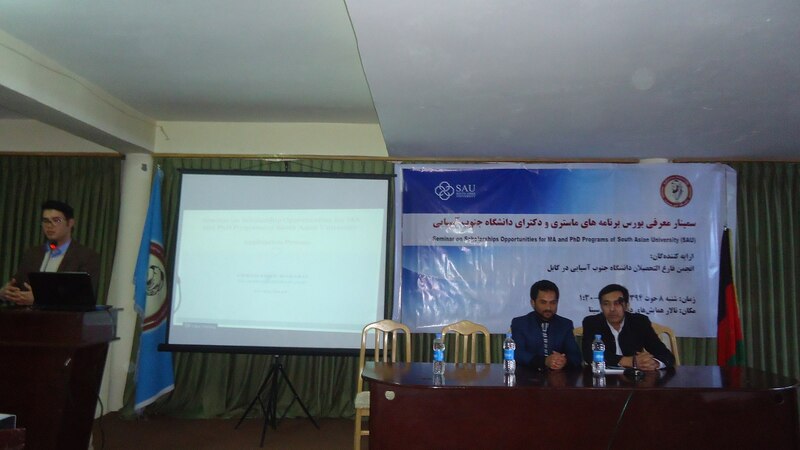 Kabul: Afghan Students Alumni in Kabul, in collaboration with Avicenna University organized a seminar on 27 February 2016 on introduction MA and PhD programs of South Asian University and the application procedure for the 2016-17 entrance test. The seminar was scheduled in three parts. The first part comprised of a general introduction of SAU. In the second part, four people graduated from difference departments of SAU, thoroughly introduced each their respective faculty. In the third part a step by step guide to the online application form was presented to the participants. The first part began with a general introduction of SAU by Hussain Alemi, a graduate in Development economics. He pointed out the strengths and weakness of SAU. Alemi ranked SAU neither a first class university nor a lower class but a middle class university with much better facilities available. 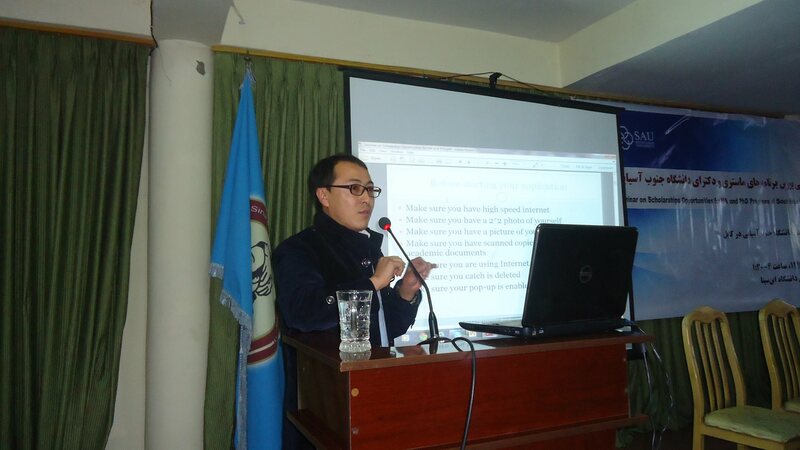 Furthermore he shed light on the challenges students from Afghanistan, Bangladesh and Bhutan face in the university. These included the syllabus each department pursue and how difficult it is for students of these countries to coupe up and compete with Indian students. He concluded his presentation with a brief introduction of SAU history. Mahdi Frough a graduate in Development Economics was the first presenter to have commenced the introduction of faculty of Economics in the second part of the seminar. However, Frough on the contrary encouraged all the participants to not miss the opportunity and try hard to enter SAU. He also mentioned his own experience at SAU and how it had been difficult for him in the first semester to score well and he was astonished on scoring low when the first semester result had been out. Importantly, he illustrated Development Economics updated syllabus and he mentioned how that helped him to get admission at IGIDR for his M.Phil. In the process he praised all the faculties in the department and their extraordinary professional excellence. He concluded his presentation with exhibition of pictures from various events at SAU and referenced important books for the entrance exam. Frough currently works as a researcher at Samuel Hall Consultancy Company in Kabul. Nasir Timory a current researcher at Integrity Watch Afghanistan (IWA) and a graduate in International Relations from SAU gave an introduction of International Relations and Sociology. Timory accentuated the research oriented approach SAU follows. He linked knowledge on the basis of research. Moreover, he encouraged participants to follow social science subjects in Delhi. For him Delhi is one of the centers in Asia that attracts prolific scholars in all fields. To that end Delhi is center of network building. As a stance he mentioned meeting famous Afghan politicians such as Abdullah Abdulllah and Sema Samar whom he couldn’t reach in Kabul. Summing up his presentation, he introduced two professors from two departments. Dr. RajenHarshe and Dr. Sasanka Pererav both of whom have the teaching experience both inside India and abroad. Eventually he emphasized on having advanced English command for pursuing their higher studies at SAU and referenced “Globalization of World Politics” as an important source for preparation of entrance exam at SAU. Following introduction of IR and Sociology, departments of Computer Science and Mathematics was introduced by a current Ali Akbar Ahmadi, a graduate from Faculty of Computer Science of SAU and currently Lecturer and Dean of Faculty of Computer Science at Kateb University. He started with a general introduction of the Faculty. As the main objective of the faculty he pointed out the integration of the two departments. He described subjects such as Optimization theory, Probability and Statistics, Numerical Analysis and scientific Computing as the main research areas at the department of Applied Mathematics. Additionally, Computer Architect, Algorithms, Networking, Data Bases, Embedded Systems, Soft Computing and Software Engineering are the subjects under research at the department of Computer Science. Unlike other presenters, he illustrated the weakness and strengths of the faculty. 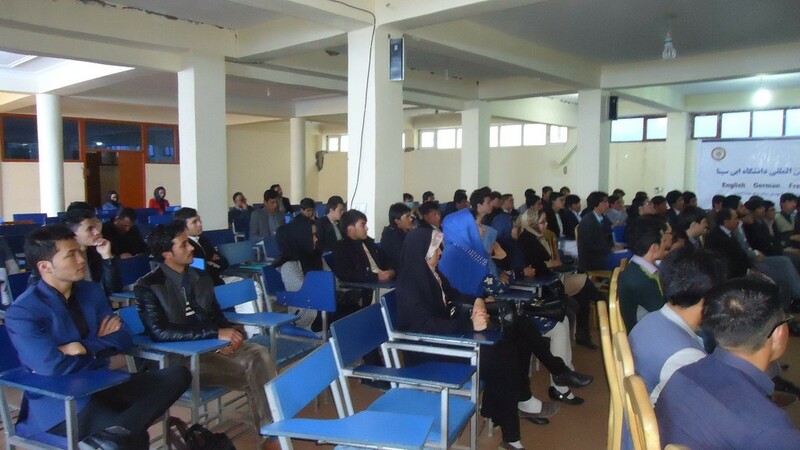 Experienced professors, better facilities such as general laboratory, comprehensive syllabus for Afghan students and research oriented approach were the strength points he described while on the weakness part he added decreasing cadre professors at the department of computer science and closed environment. Concluding his presentation he introduced admission requirements at both masters and PhD levels and named important reference books for the entrance exam. At the end of second part of the seminar, Ahmad Zubair Yousufy another graduate from IR department of SAU introduced the faculty of Legal Studies. He began with the main vision of the faculty. Among the important subjects, International Law as the faculty give greater importance was introduced. He gave an account of the importance of International Law among South Asian countries and how it would contribute to tackle the legal issues in the region if the legal systems of the concerned countries are given greater focus. Furthermore, he described the structure of the faculty in both masters and PhD levels. A comprehensive description of eligibility criteria was put forward. At the end of his presentation, he also provided the participants and especially those who were interested in pushing LLM at SAU; references, the most important among them included General Principles of International Law. Ahmad works at the ministry of women affairs as an adviser. In the third section of the seminar Ahmad Shah Mobariz, a graduate of the Faculty of Economics of SAU, and currently lecturer at Faculty of Economics of Avicenna University, introduced the application process for the entrance test of SAU. One of the most important admission requirements of SAU that is online application form scrutinized step by step. He highlighted the online admission fee payment through various methods and cleared doubts on various technical issues pertaining to application process. He worked out a demo application for the interested participants. At the end, in an interactive session those interested to apply for various programs at SAU, interacted with presenters of various departments.